Organisation is the root of a relaxing journey. 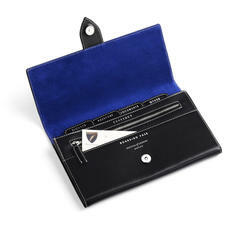 Smart practicality and detail-focused design meet in our selection of Leather Travel Wallets. 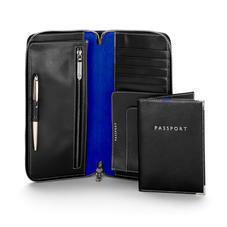 Our Multi Currency Wallet is an elegant solution for organising holiday money and the Classic and Deluxe Travel Wallets have dedicated space for tickets, documents, your passport, currency and a boarding pass. The zipped wallet offers further features in equally sleek dimensions. Add personalised initials for a personal touch and explore an array of distinctive shades. Save 20% when you buy our Travel Collection. Shop Now. We have won a renowned reputation for our Travel Wallets and Travel collections and have been awarded "Best Quality" Travel accessories by "Sunday Telegraph" compared with other leading luxury Brands. 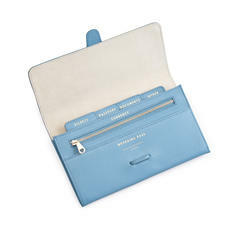 Aspinal travel document holders are made from beautiful hand dyed and hand waxed leather. You can choose from colourful premium Jewel Calf, smooth English Bridle leather or our Safari Croc Calf leather. 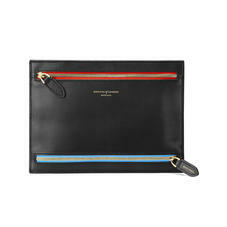 Each travel wallet is luxuriously lined in moire silk and contrasting plush soft-suede. Awarded "Best Quality" Travel accessories by Sunday Telegraph Aspinal travel wallets are sophisticated, elegant and very chic and affordable prices! So if you want to feel a million dollars when you next flourish your tickets, why wait?